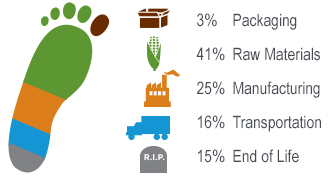 We all need to eat more greens, why don't we also eat more "green" at the same time? Compostable Salad Bowls are made from plant-based plastic and are certified compostable in a commercial compost facility. When you need a salad container for your leafy treats and you aren't into landfills, our clear Salad Bowls do the trick. Now you see 'em, compost 'em and you won't. Lid for our 18 oz salad bowls. Made from 100% renewable resources. Top Diameter: 5.5" Height: 0.50". This 24 oz. salad bowl is just the right size for a small salad. Made from 100% renewable resources, this compostable 32 oz. salad bowl is not too small, and not too big but juuuussst right. 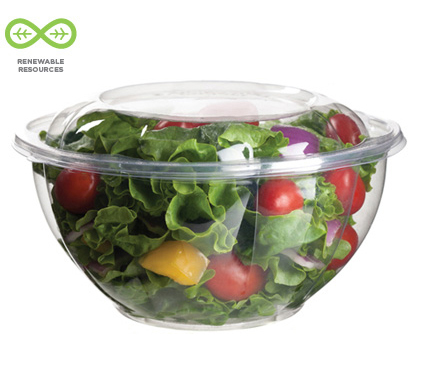 This renewable and compostable salad bowl works great for a large, family-sized portion of a cold salad to-go. 24 oz. salad bowl without lid. Made from 100% renewable resources. 32 oz. salad bowl without lid. Made from 100% renewable resources. 48 oz. salad bowl without lid. Made from 100% renewable resources. Lid for our salad bowls. Made from 100% renewable resources. Fits 24, 32, and 48oz salad bowls. Lid for our squat bowls. Made from 100% renewable resources.